If you’ve ever tested a prerelease operating system, you know that each new build brings with it a whole host of changes. And if screenshots of the upcoming—and apparently leaked—Build 9901 of Windows 10 are any indication, beta testers are about to get a sizable haul of new features and improvements. According to Windows-focused blogger Paul Thurrott, this new build improves upon and adds new features to the taskbar, search, and the Cortana virtual assistant, among other things. The search button in the taskbar gets an update in that you can now view it as a button or as a search field, or you can hide it altogether. Microsoft also tweaked the titlebars for windowed Modern UI apps, adding a new “full screen” button and an options menu icon in the upper-left corner that resembles Android’s “hamburger” menu. Visit Thurrott’s Supersite for Windows for his screenshots and initial observations of Build 9901. The story behind the story: Windows 10 will be a much more traditional, desktop-centric release of Windows than Windows 8 and 8.1 were. A final release is still months away—it should arrive in the middle of 2015—but it’s currently available to developers and enthusiasts in the form of the Windows 10 Technical Preview. 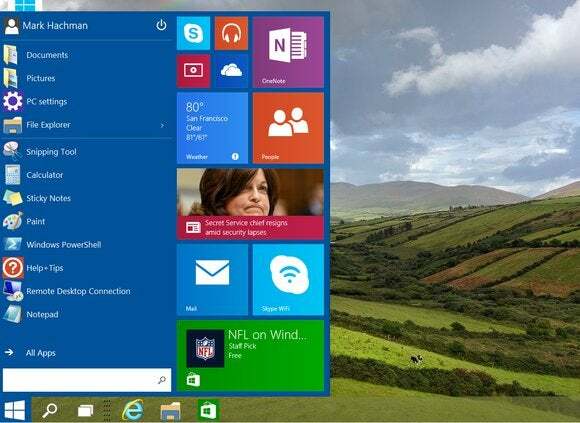 Microsoft is expected to release a a more complete “Consumer Preview” of Windows 10 some time in January. Build 9901 is yet another step toward the Consumer Preview, though Microsoft will probably continue to make tweaks and improvements between now and when the Consumer Preview is ready for the masses.